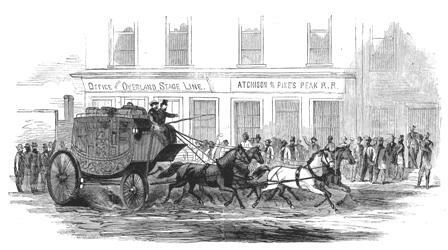 On September 15, 1857, businessman and financier John Butterfield of Utica, New York won a coveted six-year, $600,000-a-year federal contract to transport mail twice a week between St. Louis, Missouri and San Francisco in 25 days. At the time, it was the largest land-mail contract ever awarded in the United States, requiring mail deliveries year-round. In modern terms, what the two stage lines offered in mail delivery could be the contrast between today’s fiber optic network and a dial up computer connection. In the mid-19th century, bringing the continent together by stageline from St. Louis to San Francisco with such unheard of speed elicited wonder and excitement and tremendous pride. John Butterfield’s line followed the so-called “oxbow route,” skirting the Rocky Mountains and heavy winter snows by traveling south through Texas, the New Mexico Territory, Fort Yuma, near present-day Yuma, Arizona, and Southern California, before rolling on to San Francisco. It bypassed San Diego. The undertaking was enormous. Butterfield, in association with the principals for Wells, Fargo & Co. (for the American Express Co.), invested more than a million dollars getting the stage line organized. 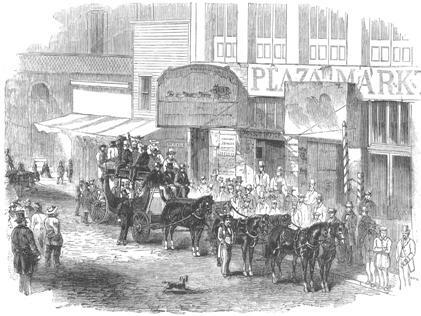 The company had to build or repair roads and bridges, set up and staff about 150 stations, purchase stagecoaches and wagons, as well as buy horses, mules, and feed. Water wells had to be dug and mountain passes cleared. And, there were 800 employees to be hired! While the western end of the Central Overland California Route was controlled by Wells, Fargo and Co., the eastern end of the route was taken over by Ben Holladay, who called his line the Holladay Overland and Express Company. (8) Packages and mail on Holliday’s stage line were delivered to his terminus at Salt Lake City then further carried westward in Wells, Fargo’s charge. (9) Hard feelings mounted between the two operators. Holladay disliked collaboration and Wells, Fargo became infuriated by his high rates and the poor care of his equipment and animals. 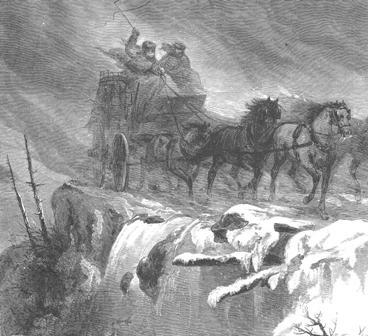 (10) Holladay’s abrupt sale of his line to Wells, Fargo in 1866, enabled the company to have a long-distance stagecoach and mail service monopoly, until the completion of the transcontinental railroad in 1869. (1) David Nevin, Time-Life Books Eds., The Expressmen, The Old West, Time-Life Books, New York, 1974. P. 32. (2) Waterman L. Ormsby, The Butterfield Overland Mail: Only Through Passenger on the First Westbound Stage. Edited by Lyle H. Wright and Josephine M. Bynum, University of California Press, 1991. (3) Kenhelm W. Stott, “Stage Coach Operations in San Diego and Imperial Counties, 1857-1874.” Ms. San Diego State College, 1950. On file in the Research Archives, San Diego Historical Society. P. 30. (4) Nevin, The Expressmen. Pp. 100-108. (5) W. Eugene Hollon, “Great Days of the Overland Stage,” American Heritage Magazine, June 1957, Vol. 8, No. 4. (6) Frank Root and William Elsey Connelley, The Overland Stage to California. Crane & Co., Topeka, Kansas, 1901. P. 42. (8) Nevin, The Expressmen. P. 209.